This article first appeared April 30, 1971, in the publication Mayovox. Because of a visit to the Clinic last January, a patient from a Midwestern state has learned of relatives he never knew existed. Providing patients with family trees is not a routine Clinic procedure, nor do Clinic consultants often double as genealogists. When they do, their interest lies not in uncovering an illustrious ancestor but in tracking down persons who have inherited a familial disease. The search, which has involved Dr. Jorge E. Maldonado and Dr. Virgil F. Fairbanks, began when a patient who came here because of an unrelated ailment told Dr. Maldonado that he had a previously diagnosed blood condition which is characterized by a high hemoglobin and an excess of red blood cells (polycythemia). He was also concerned because his father and several other near relatives had heart attacks when young, and wondered whether this might be due to the polycythemia, and therefore place him at high risk of having a fatal heart attack also. Recently, the patient said, he had attended a family funeral which brought together cousins he hadn’t seen in years. He discovered a surprising thing. Five of his cousins had independently been found to have polycythemia. To the patient this was a startling coincidence. To Dr. Maldonado, whose subspecialty is hematology, it was a clue that the patient and his family had an entirely new kind of polycythemia. There are, Dr. Maldonado explains, several types of polycythemia. The best known type is called polycythemia vera, and it is a primary disease that develops, as does a tumor, with no known related cause. There are also types of secondary polycythemia due to some other co-existing condition, such as chronic lung disease. Only in recent years has it been shown that some cases of familial polycythemia are due to the presence of an abnormal hemoglobin. In such cases, the abnormal hemoglobin is unable to perform its natural function of transporting oxygen from lungs to tissues, and the body responds to this problem by making even more red blood cells containing both normal and abnormal hemoglobin. 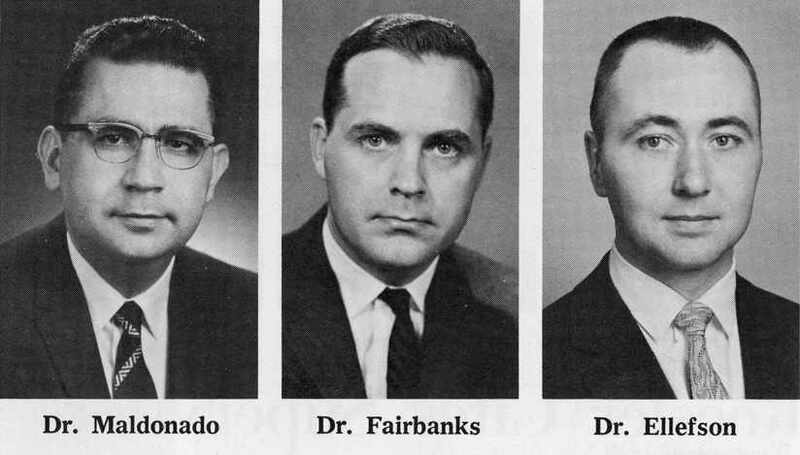 Dr. Fairbanks, who has also worked in the field of blood disease prior to and since he became a member of the Clinic staff, carried out studies on the patient’s blood, and in addition, served as liaison between Dr. Maldonado and investigators at Johns Hopkins Hospital in Baltimore, Maryland. These investigators had previously reported the first cases of familial polycythemia due to abnormal hemoglobin. Tests on blood samples sent to Baltimore confirmed that Dr. Maldonado’s patient had a similar, but new and probably uniquely abnormal hemoglobin as the cause of the polycythemia. Subsequently, it became urgent to establish how many other members of the family were affected by this disorder, and whether the history of early heart attacks in other members of the family might be explained by the polycythemia. As more and more relatives were contacted, it became apparent that the family is astonishingly large. To date approximately fifty members have been studied in four generations. Nearly half of these have polycythemia. Of the either paternal uncles of Dr. Maldonado’s patient, four are living, and two of these uncles have sixteen and seventeen children, and approximately fifty grandchildren each. Attempts to locate and identify other affected members of this family are still in progress. A conservative estimate is that there are at least two hundred family members living in Illinois, Missouri, Wisconsin, and California. It is possible that half of these people possess the structural defect in the hemoglobin molecule, and consequently have polycythemia. Other cases of polycythemia have been reported in the medical literature, and also identified at the Clinic, but none has involved as large a number of members in the family. The significance of this study is that it will alert physicians of the wide-spread occurrence of polycythemia in members of this family and in their descendents, who will be very numerous, and to provide means to differentiate it from the far more serious disease, polycythemia vera. In addition, a new element has been added by studies of Dr. Ralph Ellefson of the Section of Clinical Chemistry, who has shown that many members of this family have abnormal lipoproteins, which could well account for the strong family history of fatal heart attacks in early adult life. The study of the polycythemia and abnormal lipoproteins in this very large family is a unique opportunity to establish whether there is any close association (or genetic linkage) between the genes controlling plasma lipoproteins and those determining hemoglobin structure. This is not only a question of considerable theoretical interest, but of very practical importance for members of this family. For, if a member of the family has the polycythemia, but not the lipoprotein abnormality, he may be reassured, Drs. Maldonado, Ellefson, and Fairbanks believe, that the polycythemia is essentially a completely harmless condition.